On the one hand, this idea allowed to reduce considerably your budget : very important thing! On the other hand, the kayak is an excellent way to get some privacy, comfort and cover long distances. The layout of the itinerary passes through symbolic places of Baikal, most of which are accessible only by kayak, like the Sennaya and Peschanaya bays, the Beliy cape. We can also see Nerpas (Baikal fresh water seals) where the kayak is the single means of transport that does not frighten animal. 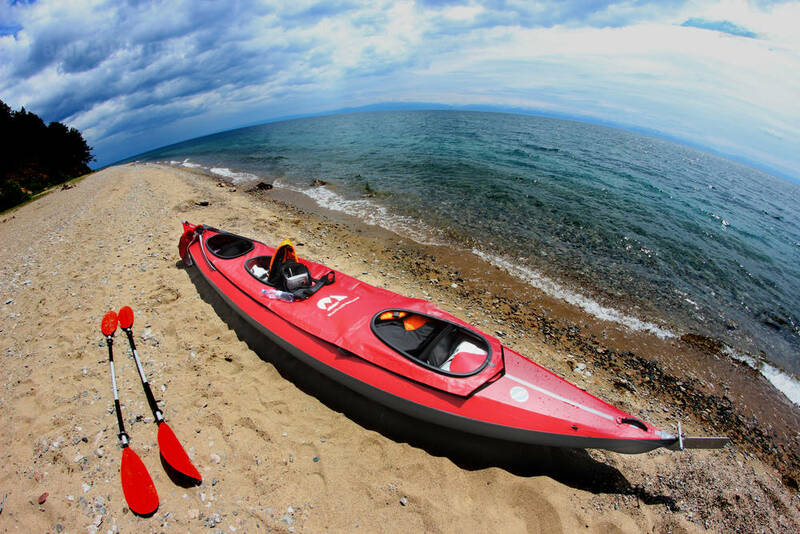 Thus, we put our kayaks into the water at Bugul'deika and sailing in the south up to the Village Bolchoe Goloustnoe crossing the famous Peschanaya Bay, where we will make a break to discover all treasures. After 5 days of autonomy way, we will get off to Irkoutsk. Many times itinerary will allow to walk around the coast, discover taiga and views of the lake. Last models of sea kayak Triton, Russian brand, are used to provide security and comfort. These collapsible kayaks have a rigid structure, inflatable edges that make it unsinkable. 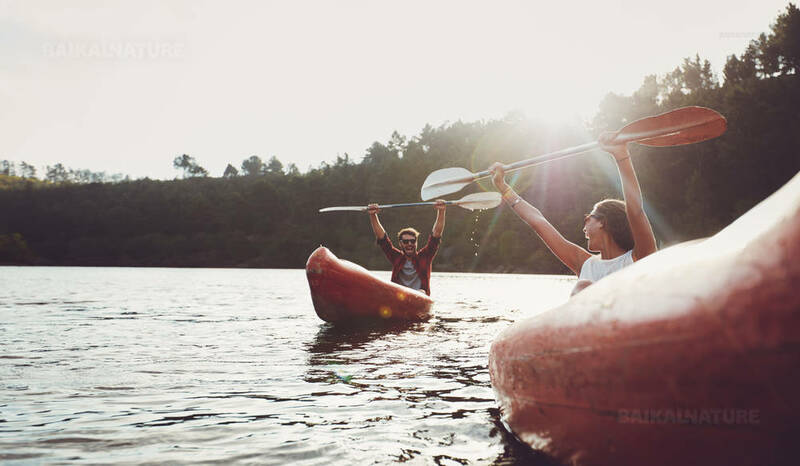 For navigating and transporting comfortably, you will seat by two in a three-seat kayak. Acquaintance and preparation for the travel. Departure on the private transport. The lunch is to be paid on site in cash. 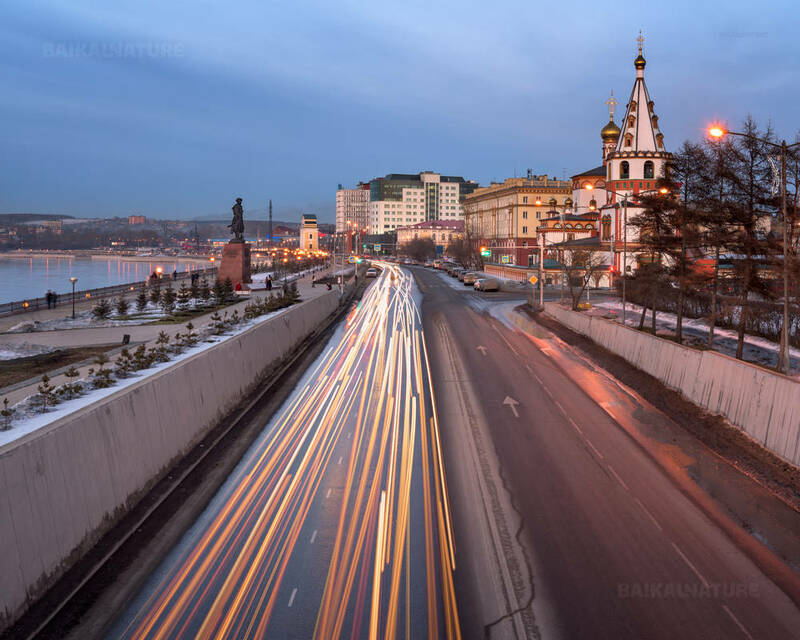 You have possibility to taste the Buryat cuisine. Mounting kayaks and Kayak's instruction. Short passage to the Beliy cape (White cape) - about 5 km. Setting up of the campside. Accommodation by 2 persons in a tent. Rest. After yesterday's training, today we will do a few more kilometers. All-day travelling to the north along the mountains and the taiga. This is the longest part of the journey. We will make a stop on the picturesque beach of the lake for the rest and the open-air lunch. In the afternoon, we will reach the Sennaya bay. This bay is a specious meadow surrounded by the tayga. Installation of the camp and rest. During this day we will make a stop in one of the most amazing places of lake - Peschanaya bay. There is a large send beach and "Stilt" trees. After the breakfast, we continue our itinerary to the south. 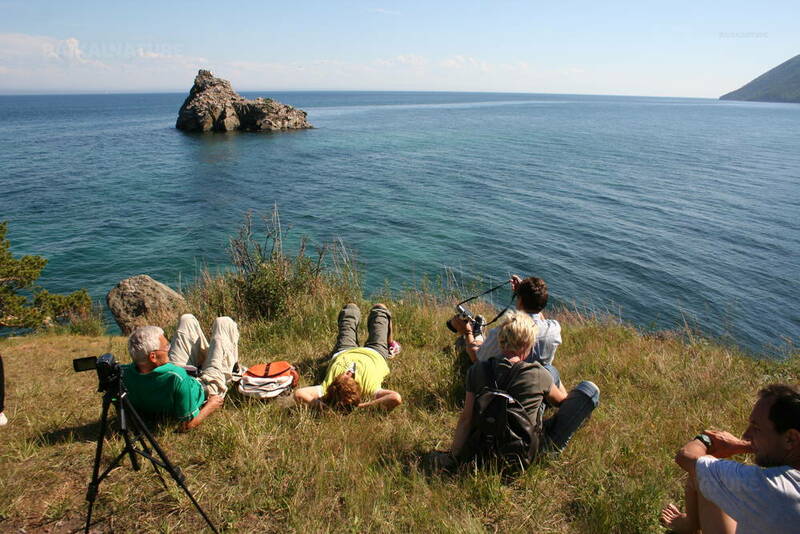 If the weather is fine, you have possibility to watch the nerpa, the endemic seal of lake Baikal. You will pass by the cape Baklaniy Kamen (Cormorant rock) that formerly was the habitat of cormorants. Setting up of the camp. We will go to the Bolshoye Goloustnoye village. Preparing for the departure. 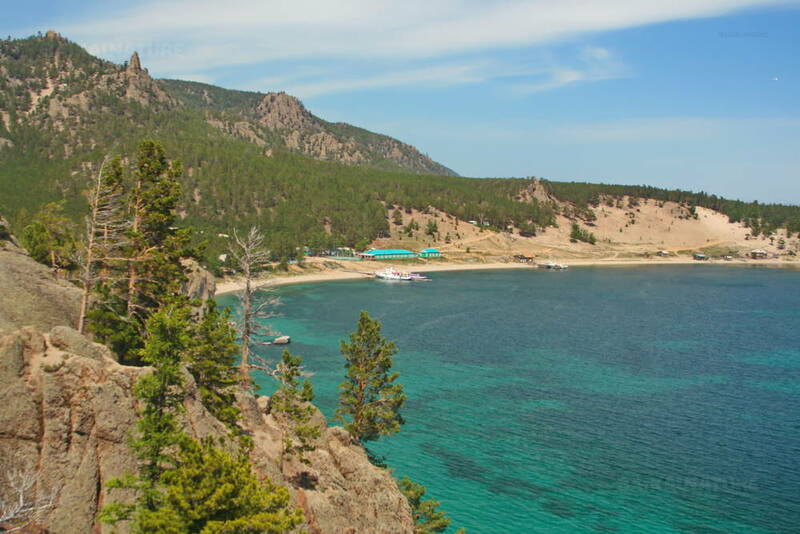 You have some free time for walking along the Baikal shore. Arrival to the "BaikalNature" office. End of the programme. The price includes breakfast on Day 2-4; lunch Day 2-4 and dinner on Day 1-4. We recommend you to arrive the day before for avoiding to be late. To note: maximum weight to take part in this trip is 100 kg. The price of the tour includes travel health insurance for persons under 75 years. The timing and the itinerary of the your is approximate. This tour is held on the uninhabited coast of the lake, far away from the civilization. The duration and the place for the stops will be defined by the guide on site for ensure your security. The Tour was great. A special thanks to our Tour Guide Andrey who made our trip very special for us. One little thing: Maybe you should get new tents. The ones we had basically worked but they were quite broken. Still Great Tour! Dear Alfred, thank you for your comment. We will renew the tents for the next year and we plan to give our guides the set of the repair details just in case. Je suis parti seul avec un guide ( Egor) sur le Baikal en kayak. J'ai vraiment apprécié son comportement et humainement une personne intéressante. Darya au bureau vous assiste pour vous aider avec une grande amabilité. Un excellent séjour. J'étais très bien sûr les rives du Baikal à dormir dans la tente. Le retour au milieu du monde est pus difficile.